Visit the official website of LPUNEST and click on the results link. Enter your application number and date of birth and click on the submit button. Take the print out of the LPUNEST result. LPUNEST 2019 Results will be published on the LPUNEST 2019 Result Date, i.e. 4th May 2019. Candidates can visit the official website in order to check for the results. An intimation message for LPUNEST 2019 exam result will be sent to the candidate's registered email id. 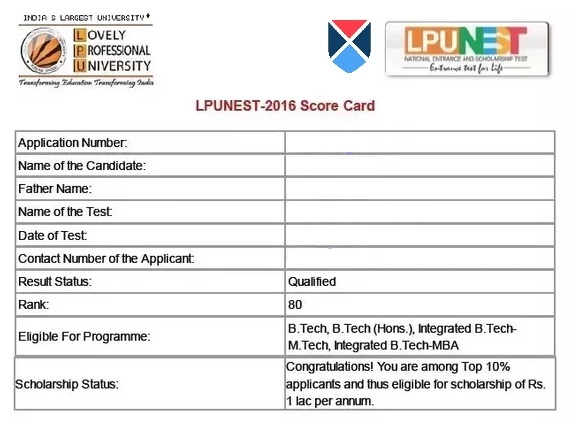 LPUNEST 2019 merit list would be prepared on the basis of candidates’ performance in the entrance test only. Candidates should download their scorecard and preserve it for future reference in case any problem arises. Step1: Go to the LPUNEST 2019 official website of LPU university. Step2: Click on ‘View Result’ tab. Step3: Enter your valid credentials, which are LPUNEST 2019 application form number. Step4: Click on the submit button and you can view your LPUNEST 2019 result. Step5: Make sure to take the print out of the LPUNEST 2019 result for future reference. The LPUNEST 2019 results will determine whether candidates get admission and if the candidates are eligible for a scholarship in Lovely Professional University 2019. The scholarship is available to students on the basis of the various parameter. op 35% applicants appearing for LPUNEST (B.Tech. ), will get a chance for Scholarship up to 1.5 Lakh p.a. (i.e up to 7.5 lac in case of 5 years integrated Programme and 6 Lac in case of 4 years for B.Tech. programmes as a whole). The scholarship is awarded on the basis of performance in LPUNEST 2019 exam alone. Scholarships are available for students pursuing any programmes in LPU except for Diploma in Elementary Education (D.El.Ed). Scholarship for Hons/ Integrated/ Professional Programme will be the same as corresponding regular Programme candidates can also avail the benefit of LPUNEST #scholarship scheme. On the basis of National Level Tests- scholarship applicable to Programme based on performance/ rank: JEE Main, CMAT, NATA, CAT, XAT, MAT, GATE, NEET, CLAT. On the basis of Sports, Cultural, R&D, Co-curricular, Social Service, Bravery Awards. In case an applicant fails to produce the proof of fulfilment of prescribed LPUNEST 2019 eligibility criteria or any other document prescribed by university or fails to provide original documents for verification by the stipulated date(s), he/she shall not be considered eligible for admission/ scholarship, in any case, if granted due to any reason shall be cancelled and applicant shall have no claim, whatsoever against the university. Will the result show if the candidate is eligible for an LPUNEST scholarship? The LPUNEST results will determine whether candidates get admission and if the candidates are eligible for a scholarship in Lovely Professional University. Where can I check my LPUNEST examination results? You have to click on the "View Result" button on the website to view your results.